But first, a bit of Inside Voices business. It seems like it's been awhile since I've posted about my (our?) favorite stone (concrete?) 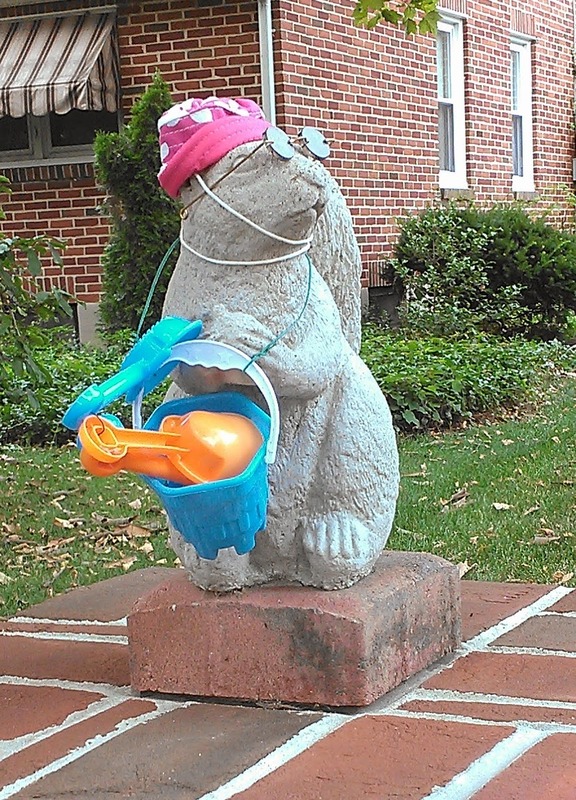 squirrel statuary. I haven't been going on as many afternoon walks of late -- the fact that Lily throws herself on the floor and writhes around like an upended june bug every time I mention the word "walk" might have something to do with this -- so I haven't happened by the squirrels too often. "Look at that!" I said to myself. "New outfits!" And I yelled at the dog to stop dragging my arm out of its socket long enough to snap pictures and went on my merry way, excited to end our bushy-tailed rodent drought. 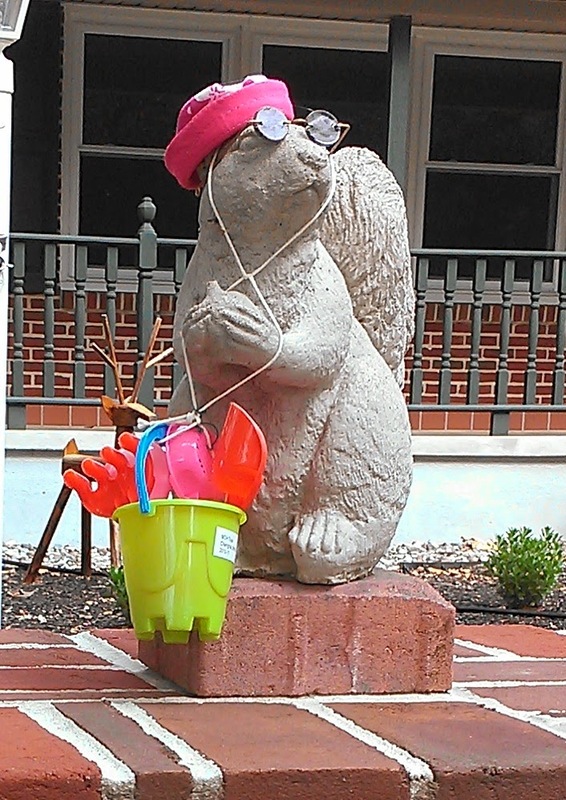 But alack, the sun hats, sunglasses and sand buckets replete with shovels, aren't knew. They rocked this look just last year, in fact. And I wrote about it and everything. It's disappointing to say the least. But the whole deja-squirrel experience has me thinking it might be time to change up my walk route. Who knows what other neighbors have in store for me? So stay tuned. Now on to the other news. A while back, in a moment of foolish "why the hell not" blind optimism, I submitted a short story I wrote about one horny, two-faced young Scotsman named Donovan MacWallace (you might remember him from this post) to a local literary competition. It was the first time since high school that I'd submitted any sort of fiction/poetry/creative writing for review by literary sorts. The $5 entry fee seemed a cheap enough risk to take. Anyway, I got a phone call on Friday that I'd won third place for the story. Before you say it, yes, I know. I'm a pretty big deal. In the future, you'll have to have your people call my people to hear stories about how my 3-year-old stuffed Play-Doh up her nose and had to blow it out in an explosive puff of snot and day-glo yellow goo. The contest coordinator tells me there were "a bunch of entries," so I'm just going to go ahead and assume the staff waded through thousands of top-notch literary submissions before deciding that mine deserved a tip of the hat. She also told me they would be having a reception and reading of the winning entries. "Please let me know if you are available to read your piece," she says. Aside from the fact that I feel calling a story that features the phrase "Nessie stirred under his kilt" in reference too … well you know what it's in reference to … "a piece" might be giving it a little too much artistic merit -- I'm terrified at the prospect of reading my "piece" in front of a room full of literary sorts. For one, I will have to actually read out loud the phrase "Nessie stirred under his kilt" (among other ridiculous excerpts) but given the fact that my main character is a grown American man passing himself off as Scottish by channeling Groundskeeper Willie from "The Simpsons," I imagine I'll have to attempt some sort semblance of an accent, too. On top of that, my britches got extra inflated today when the super-sweet blogger behind Budget Blonde and newly minted mother of twins sent me an encouraging note/kick in the pants that I could and should be doing more to building the audience for this site. Anyway, stay tuned for that, too.